Nintendo are renowned for sailing against the wind. I for one hope they never change. Honestly, trust Nintendo to offer a remastered, ten-year-old GameCube game as their rebuttal to the threat of Sony and Microsoft’s upcoming consoles. If it was anyone else, you’d be forgiven for thinking they’d lost their marbles. But this is Nintendo we’re talking about: a company who knew, clearly, that they could transform The Legend of Zelda: The Wind Waker HD into a bonafide system seller. 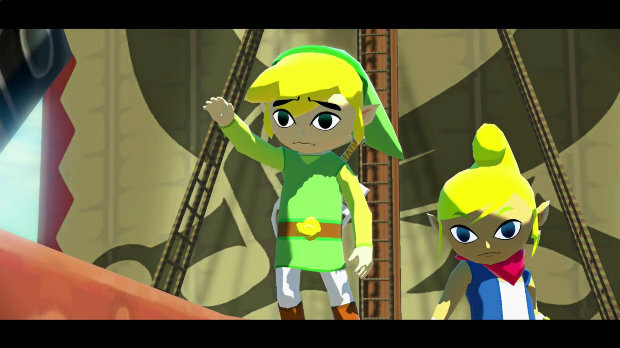 For the forlorn few who missed out on The Wind Waker, the story centres around Link’s crusade to rescue his sister. Snatched in plain sight by a troublesome giant bird, Link’s coming of age is tested as he vows to save his sibling. By mastering control of the wind using a magical baton known as the Wind Waker, and with the help of a talking boat known as The King of Red Lions (so awesome), Link’s cartoon-coated story features peril, twists and a refreshing blend of humour. For a game that focuses on streams of text over voice acting, the lasting impression Wind Waker’s mythical tale creates should not be overlooked. 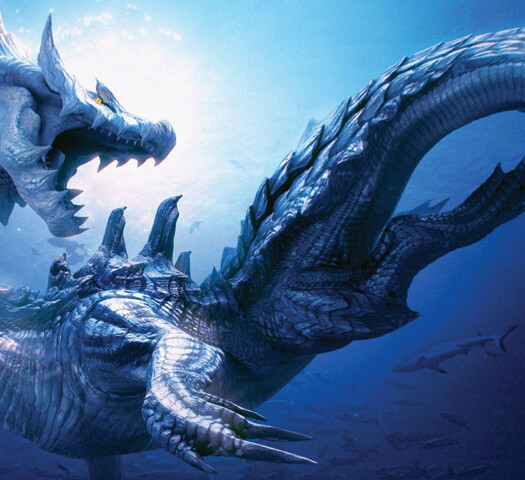 Characters are buoyed by expressive animations and exude charisma, whether that’s a friendly fish in the sea or a sinister weapon-wielding enemy. Simply put, Wind Waker produced one of the series’ most engaging tales. The new lighting engine, a controversial addition, amplifies every touching scene with aplomb: rays of sunlight warm the skin, caverns appear claustrophobically starved of air, the Great Sea, well, it’s bluer than ever. As it was back then, my attraction to Wind Waker HD was instantaneous – yours will be too. The majestic beauty of Wind Waker’s timeless art style rendered me speechless, again, sucking me in quicker than the unsightly snot which hangs precariously from one young islander’s nose. The new lighting engine, a controversial addition, amplifies every touching scene with aplomb: rays of sunlight warm the skin, caverns appear claustrophobically starved of air, the Great Sea, well, it’s bluer than ever. Everything feels reborn – a stupendous feat all things considered. The little things come to life in Wind Waker HD; details that were originally hidden under a blurry blanket of standard definition suddenly pop and sparkle. Grandma’s face becomes all the more pinchable, Tetra’s eyes glisten with a renewed sense of mischief and Link’s face literally can’t contain his emotions. The Great Sea finally lives up to its name with impressive draw distances, too. Animations benefit greatly, also. The flailing legs of a disgruntled piglet, a nearby guard’s posturing walk, the playful wobble of Link’s blonde quiff – the world of Wind Waker HD has never felt so alive, and you’ll want to rediscover every inch. Don’t waste your time cutting grass for half an hour like an idiot – there’s so much more to do. Charting new waters is finally a painless endeavour in Wind Waker HD, a merciful blessing considering the expansive ocean that awaits. You still have to direct the wind, set sail and fiddle with your thumbs until you arrive at your destination. However, you can now purchase a Swift Sail after the inaugural dungeon, which provides a hearty speed boost and eliminates the need to constantly wake the winds. Shrewder players will seek out the Ballad of Gales, though, a song that lets you ride atop cyclones and instantly teleport to locations. Link will sail straight into your heart. Nevertheless, sailing the Great Sea still invokes a wide-range of heartfelt emotions. When you’re crashing through the waves with a flock of seagulls circling overhead, it’s hard not to swell with pride. Listening to the creak of the mast whilst gazing up at the stars is another stirring example which few games can match. Even though I’ve never entertained the idea of sailing, Wind Waker HD is a damn fine advertisement. The GamePad, subject to much unfair derision, manages to make a great game even better. Aiming your grappling hook is as simple as tilting the controller, switching items is one finger drag away and won’t rudely pause the on-screen action. Maps are begging to be viewed at a glance, while the tales of other players’ adventures on Miiverse appear instantly thanks to the ingenious ‘Message in a bottle’ system. Of course, the perk of playing the game without the TV will never grow old, either. Combat is still a cut above other entries in the series. Nintendo’s patented Z-Targeting system works just as flawlessly as it has since its inception on the N64, but it’s the breadth of attacks which Link can perform that really makes the combat zing. Thrust, slice, counter and guard, Skyward Sword may have forced you to physically perform the actions but its Wind Waker HD which lets you feel them. Unfortunately, despite Nintendo’s best efforts, the infamous Triforce fetch quest still stands out as one of the game’s few misfires. Changes have been made to streamline the dull end-game expedition, but honestly, if the rest of the game wasn’t so brilliant, perhaps this would be a non-issue. Thankfully, it’s one blot on an otherwise mesmerising voyage. 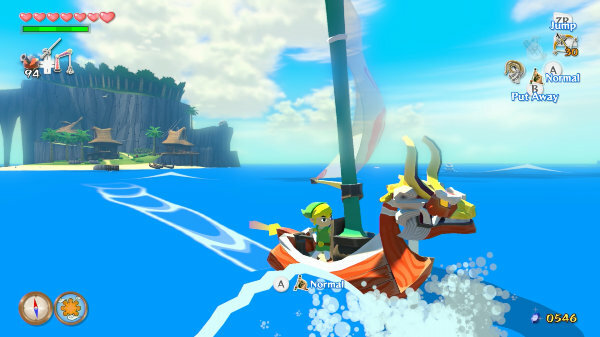 A review copy of The Legend of Zelda: The Wind Waker HD was provided courtesy of Nintendo. Timeless, charming and heaps of nautical fun, Nintendo have bettered Link’s 2003 adventure in practically every way. If you’re a Wii U owner, or missed out on the GameCube original, plunder your savings and plot a course for Wind Waker HD; the word ‘remastered’ has never been so fitting for this sumptuous, unmissable classic.